THIS AWARD MAY NO LONGER BE CLAIMED. THE DATE FOR CLAIMS HAS NOW PASSED. 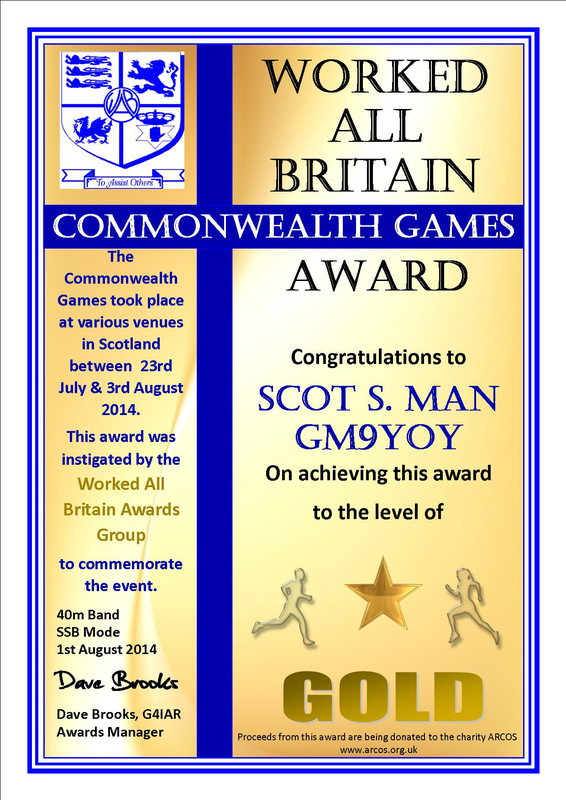 To commemorate the Commonwealth Games being held in Scotland this year, members of The Worked All Britain Awards Group will be activating an event station each day from 23rd July to 3rd August from various locations in Scotland. 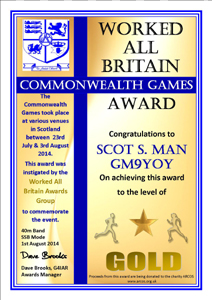 The callsign to be used will be GB4CGS (Commonwealth Games Scotland). The award will be made available for working the station on 3, 6 or 9 different days during this period, which will be endorsed Bronze, Silver or Gold respectively. Awards may also be endorsed for any band or mode. Only one certificate, showing the highest level achieved, will be issued for each band/mode endorsement. We apologise for the high costs outside the UK, but our postal service has decided in its wisdom to classify a single certificate as a parcel! However a pdf version is available to anyone for only £1 or €2/&dollar;2. You may then print the certificate yourself. Payment for this method can only be accepted in Sterling coin or via PayPal. Non-UK coins cannot be accepted. For the printed certificate we accept Sterling, Euro or US Dollar currency or a sterling cheque drawn on a UK bank.